A vibrant, emotive coming-of-age novel explores friendship and its pitfalls in a changing world. 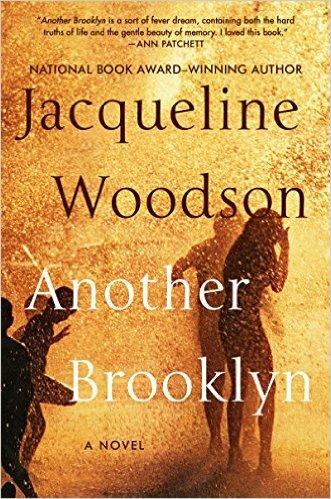 Another Brooklyn is Jacqueline Woodson’s (Brown Girl Dreaming) first adult novel in 20 years. Powerfully moving and lyrical, it demonstrates her expertise beyond the children’s and young adult literature for which she is known. “For a long time, my mother wasn’t dead yet.” This first line presents the powerful narrative voice of August, an adult reminiscing about her Brooklyn upbringing. Chapter 2 flashes back to the summer of 1973, when she was eight years old, and the novel follows chronologically from there. August and her little brother, recently relocated from Tennessee following a murky family tragedy, adjust slowly to city life. August watches a group of three girlfriends from her painted-shut, third-floor apartment window; she longs to be with them and eventually integrates herself, building an intensely close foursome. The girls share the mysteries, miseries and conquests of puberty–though their fate is hinted at by the opening chapter. Another Brooklyn visits iconic moments in culture and history: damaged Vietnam veterans, white residents fleeing Brooklyn, the influence of the Nation of Islam in the neighborhood and in August’s single-parent household, the city-wide blackout of 1977. The city offers hope to four beautiful, talented, intelligent girls, and threatens them with men in dark alleys and the limiting judgments of others. Afros, cornrows and hijabs mark fashions in time. But despite these vibrant, evocative framing elements, this is essentially a coming-of-age story in which a child comes to face the hard edges of reality, both particular and universal. Woodson’s eye for detail and ear for poetry result in a novel both brief and profound. This review originally ran in the August 12, 2016 issue of Shelf Awareness for Readers. To subscribe, click here, and you’ll receive two issues per week of book reviews and other bookish news. Rating: 7 pickled pig’s feet.